We're just hours away from learning if the old M&A rules still stand, or if it's a brave new world where vertical vs horizontal is no longer paramount. The DoJ vs. AT&T ruling is expected at around 4pm. Judge Richard Leon is said to have completed his written opinion, something he previously suggested might not be finished in time. Then AT&T will hold a press conference. Axios' David McCabe will be in the courtroom, although electronic devices must be turned off while inside. Smart money is on a complex ruling, given Leon's relatively unusual decision to summon stakeholders and reporters to the courthouse. If it's a clear win for AT&T, then the deal would close next week. DoJ could appeal, but would face the prospect of unwinding the completed merger. An AT&T victory also means Comcast would immediately formalize its all-cash bid for 21st Century Fox's entertainment asserts (which already have been pledged to Disney). If it's a clear win for DoJ, then AT&T is likely to appeal (despite deal fatigue). If AT&T didn't appeal in this scenario, it would owe Time Warner $500 million. Many legal analysts feel DoJ didn't meet its burden but, as Axios' David McCabe and Sara Fischer write: "All the DOJ needs to prove is that the merger may substantially lessen competition. The DOJ claims the merger could increase TV bills by hundreds of millions of dollars a year by 2021, though that balances out to an increase of less than $1 on a customer's monthly bill. It's up to the judge to determine whether that number is enough consumer harm to stop the deal." • Sidewalk wars: Yesterday I noted how e-scooter company Bird was raising a second tranche on top of the Sequoia-led, $150 million round at a $1 billion pre-money valuation. Several sources tell Axios that the second tranche is designed to raise around another $200 million at a whopping $2 billion pre-money (FT has a similar report, but puts the aspirational valuation at $1.5b). Bird raised its prior funding round at a $300 million pre-money just three months ago. The entire company was founded last year. Bottom line: I'm just the messenger. • Revamp: Kleiner Perkins spinout G2VP, focused on green-tech, has closed its debut fund with $350 million. Kia has more: Kleiner Perkins’ investments in green tech were famously a bust, but according to partner Dave Mount, G2VP will focus on the areas that did deliver strong financial returns — applications of digital tech to sustainability and heavy industry. • Swamp things: SEC Commissioner Robert Jackson is urging a review of stock buybacks — which are booming, thanks to the tax cuts — after finding that many execs are selling shares in the days after buybacks are announced: "It is troubling because it is yet another piece of evidence that executives are spending more time on short-term stock trading than long-term value creation." Also: The Senate is moving to reverse Trump's $1.4 billion deal to save China's ZTE, via a provision added to a must-pass defense authorization bill. Stryker Corp. (NYSE: SYK) has made an unsolicited takeover approach for Boston Scientific (NYSE: BSX), according to the WSJ. Boston Scientific shares climbed 7.4% on the news, pushing its market cap up past $47 billion. Why it's the BFD: Because this would be the medical device sector's largest merger of all-time, topping the 2014 tie-up of Medtronic and Covidien. • Warburg Pincus agreed to sell FacilitySource, a Columbus, Ohio-based provider of procurement and facilities management solutions, to CBRE (NYDSE: CBRE) for $290 million in cash. • Foundry.ai, a Washington, D.C.-based firm led by Jim Manzi (ex-Applied Predictive Technologies) and Edward Brody (ex-Yahoo), raised around $68 million for its debut fund, per an SEC filing. • Otherwise Fund, a new venture firm led by Terrence Rohan (ex-head of Index Ventures’ seed program), is raising $90 million for its debut fund, per an SEC filing. World Cup host nation equities usually outperform in the run-up to the tourney, but then slip once things kick off, according to an analysis by HSBC. 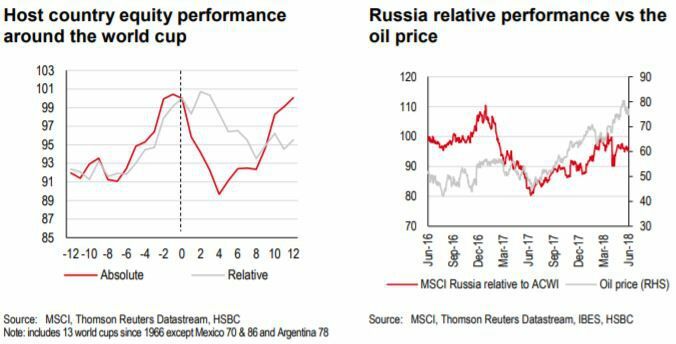 More from HSBC: "Russian equities appear to be following the usual pattern, outperforming 15% in local currency terms over the past 12 months, but fading recently on rising geopolitical risk and broader EM concern."